I love new ideas and innovative concepts that can be implemented into spas. I always get thrilled about meetingpassionate people who have come up with new, creative tools. Recently I had the opportunity to meet the person behind Aquaroll; Mr Thierry Favreau. Aquaroll is an innovative hydromassage with glass beads. The device can be used for both hands and feet and is the perfect addition to manicure and pedicure treatments. Not only for the health benefits and the visible results, but it is also a great tool for spas to up-sell additional treatments to manicures and pedicures. The device (seen at the picture) looks almost like a contemporary laundry machine, and I must admit I was a bit skeptical the first time I saw it. Will this really work? Will I enjoy this? First of all you need a comfortable chair in front of the Aquaroll machine. Once seated in the chair, you just stick your feet into the device. The feet will sink into water and thousands of softly shaped glass beads (30 000 glass pieces and 4 liters of water), already this feels very refreshing. As the machine gets started you get a lovely hydromassage of the water and the beads, in a perfectly slow pace. It feels like a continuous wave and the pressure from the beads give reflexo-therapy to the feet and the legs. I was surprised how relaxing it was and at the same time how powerful the massage was. After about 10 minutes I felt an immediate lightness in my legs and feet, almost a numb feeling, but not uncomfortable at all. The feet were soft and the skin was bright and clear. The micro circulation is boosted and it’s efficient draining of heavy legs, and at the same time it exfoliates the skin. One of my hesitations to this tool was the hygienical aspect, but the company has clear instructions about how to use it safely (and how to clean it) and the turnover time between the treatments should not be more than 5 minutes, but to be realistic I would say 10 minutes. 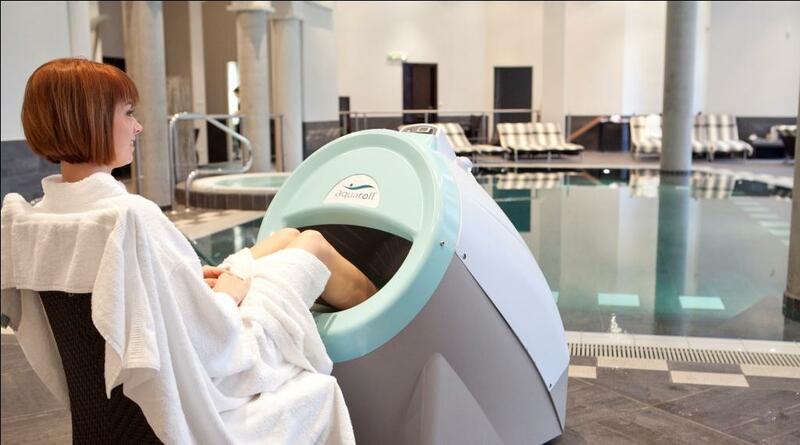 Aquaroll was launched about a year ago and can be found in spas and thalassotherapy centers, but I would not be surprised to shortly find it in many VIP airport lounges, airport spas or in VIP lounges and day spas located in shopping malls. The perfect and easy solution to achieve Happy feet!